The BiteGuard KennelPlex is constructed to handle extreme climates and withstand the rigorous activities of professionally trained dogs. 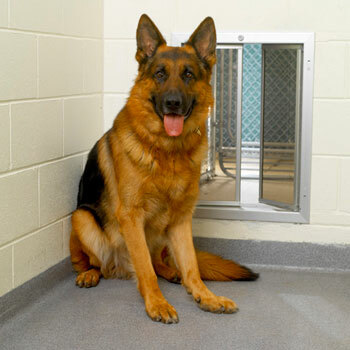 These doors are used in kennels throughout the world and have a five-year warranty that includes the panels. If the BiteGuard panels are destroyed by chewing within five years of the purchase, they will be replaced. The Extra Large PlexiDor has a similar chew protection. Call us at 800-749-9609 for more information!